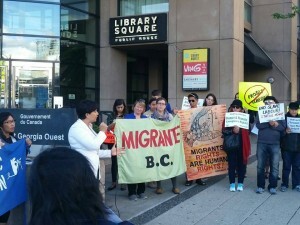 Vancouver – As the world marks International Domestic Workers Day today, local caregivers held a rally to intensify their call to end a government program that targets and criminalizes caregivers hired under the Live-in Caregiver and Temporary Foreign Worker Program (TFWP). The groups also reiterated the need to grant caregivers open work permits and permanent residency upon arrival. “Canada likes to pride itself as being a leader in the area of human rights. The reality however is that it treats TFWs, especially foreign caregivers, as disposable workers deprived of many basic labour rights. 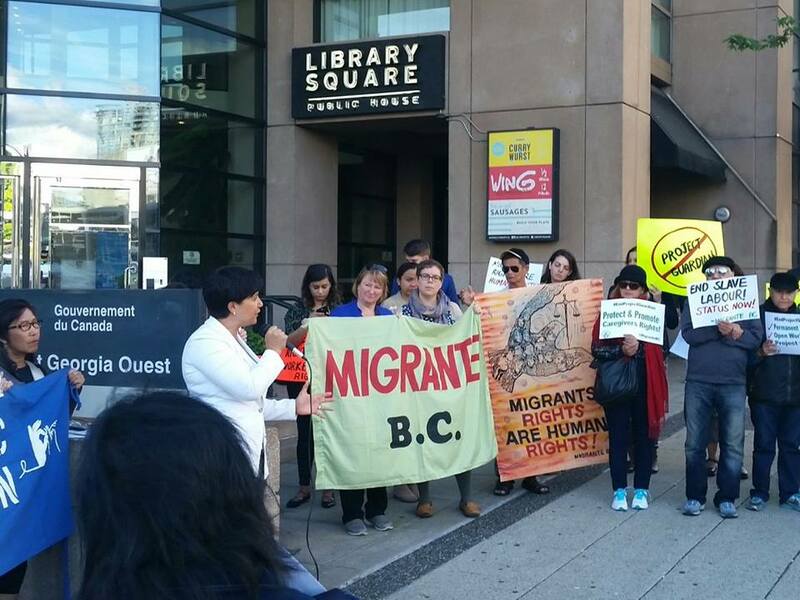 Worse, it criminalizes them through programs like ‘Project Guardian’,” says Jane Ordinario, Migrante-BC Coordinator. According to Ordinario, Canada Border Services Agency is conducting raids and deportations of caregivers found to be violating their work permits under “Project Guardian” and other initiatives like it. “These programs are a waste of tax payers money. Foreign caregivers are not criminals. The raids are often heavy-handed and very intimidating and the caregivers are not told about their legal rights during the process,” she added. According to the West Coast Domestic Workers Association Executive Director, Natalie Drolet, Canada should grant the TFW caregivers open work permits and permanent residency upon arrival. “It is unjust to tie a worker to one employer at one address. It leaves them vulnerable to abuse and exploitation because in many cases, the caregivers are afraid to leave their jobs because of the onerous process of obtaining a new work permit for a new employer,” said Drolet, whose association has been helping caregivers facing deportation because of Project Guardian. Local MLA Mable Elmore, Opposition Spokesperson for TFWs and Immigration also said more needed to be done to protect migrant worker rights. “Provincial legislation is needed to ensure that migrant workers are genuinely able to access and exercise their full legal rights, especially when they face abuse or exploitation due to unscrupulous recruitment agencies, immigration consultants or employers,” said Elmore. “It’s also important that as a nation, we show the willingness to protect and promote the rights and welfare of all workers, especially migrant workers. And a first step towards that is the ratification of this international convention recognizing the rights of Domestic Workers, she said referring to the International Labour Organization’s Convention 189 (C189). C189 was passed at the 100th meeting of the ILO in 2012 on June 16th and since then, the day is recognized as International Domestic Workers Day.